WATERTOWN – “Unveiled” is educational, uplifting and entertaining. 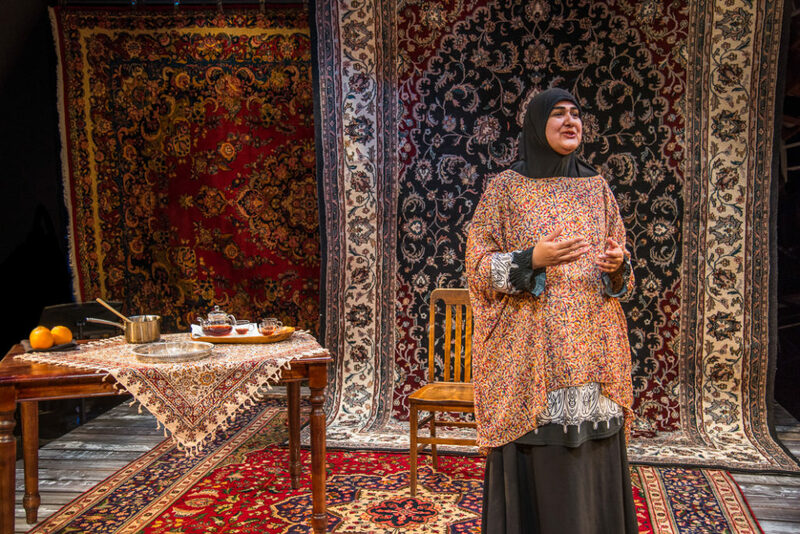 The one-woman show written and performed by Rohina Malik at the Mosesian Center for the Arts is a co-production of the New Repertory Theatre and the Greater Boston Stage Company. It tells the story of five Muslim women, all of whom wear the hijab, the traditional Muslim female head covering, and is a detailingof the bigotry and hatred they have been subjected to because of who they are and what they wear. One of the stories – a portrait of a Pakistani immigrant clothing designer – is based on the Pakistani immigrant Malik’s own life. According to a Boston Globe story, Malik, a practicing Muslim who was born in London and now lives in the Chicago area, was attending a friend’s wedding some 15 years ago when the incident happened. According to the story, she defended herself, and the situation quickly escalated. The police came and arrested the man for attempted assault. The other characters in “Unveiled” include a Moroccan-American lawyer born and raised in Chicago, an African-American woman from Dallas who has converted to Islam (she prefers the term “revert”), a South Asian hip-hop artist from West London, and a Palestinian immigrant restaurant owner from Chicago. Malik is determined to let us get to know the women better – hence the title of the piece. One of the stories is heartbreaking, that of a Moroccan American lawyer named Noor who marries an American named Joe, a convert to Islam. She cannot protect Joe – or herself – from the hatred that dashes their dreams. Inez is An African-American convert or “revert” to Islam, living in the Deep South, who is shamed when, after 9/11, she removes the hijab in an effort to protect her unborn child. Layla is a Palestinian immigrant who operates a Middle Eastern restaurant. When the planes hit the Twin Towers, her beloved brother, a medical professional, ran in and his body was never recovered. But her story is also about standing down against a mob that threatens an Islamic school and her son. The scenic design by Jeffrey Petersen is a simple arrangement of three lovely rugs, two of which are hung behind Malik as a backdrop. The tea and oranges on a wooden table net to Malik will find their ways into the tales, and Malik is also participating in a talkback – complete with chai and cookies – after each performance. Alejandro Castellano provided musical accompaniment on the oud, a Middle Eastern instrument , and his interludes are timed to provide emphasis or underscore certain portions of Malik’s testimony. “Unveiled,” a 50-minute piece performed without an intermission, will journey to the Greater Boston Stage Company in Stoneham for performances from Feb. 7-16 (greaterbostonstage.org). In my early days of journalism decades ago, a professor said the most effective way to tell a story is to “put a face on it” – i.e., use a real person or incident to help tell the story. Malik has managed to put forth the real and important faces of five diverse woman, along with the plea that they be heard and understood, with a reminder that underneath the hajib is a real person who wants nothing more than peace and understanding. The New Repertory Theatre and Greater Boston Stage Company production of “Unveiled.” Written and performed by Rohina Malik. Scenic design by Jeffrey Petersen. Lighting design by Matthew Guminski. Stage management by Logan Pratt. At the Black Box Theatre in the Mosesian Center for the Arts through Jan. 28. newrep,org.